This mugi miso from Terrasana is made with barley. This means that koji (a fermentation starter) is added to cooked barley. This is then mixed in wooden barrels with soybeans. The ripening process in these vessels takes 1 to 2 years. This mugi is perhaps the most versatile miso in terms of taste and suitable for the preparation of various dishes. The producer has generations of experience and unprecedented passion for the profession. 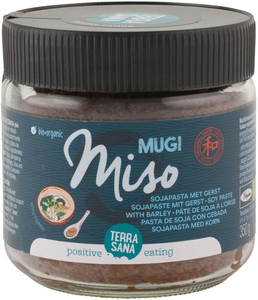 Would you like to taste your dishes with a real Japanese seasoning, then mugi miso is a nice choice. It can be used as a substitute for the bouillon cube, in wok and stew dishes or as a base for sauces and marinades. Mugi miso has an average strong taste and is slightly salter than genmai miso.